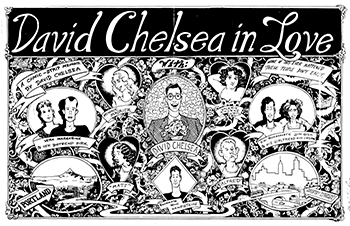 I’m beginning a new archive comics series today on Patreon, a collection of the prototype strips for my graphic novel DAVID CHELSEA IN LOVE. These were drawn over a period from about 1987 to 1989, and distributed in the form of photocopies which I gave away at performances of the Weird Al-like stand up act which I had been doing for several years in and around the East Village. The idea was that audiences would come back to follow the story (of course, it would have made even more sense for me to come up with new material to perform, but I was a slow writer). When I finished the series, I tried to market it to alternative weekly and comics publishers, but could find no takers. 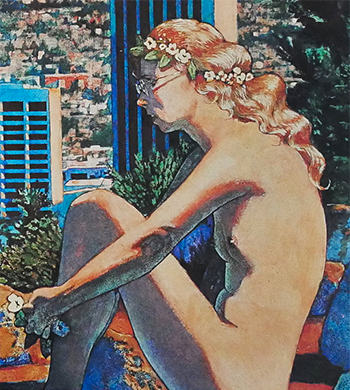 Gary Groth at Fantagraphics suggested that I expand it into a full-length graphic novel, and it was that version which Eclipse Comics eventually published in four issues in 1991-92, and as a collection in 1993. This early version did eventually make it into print when Eclipse made it part of their weekly ad in the industry publication THE COMICS BUYERS GUIDE, which actually reached far more readers than the comic itself.